Applying nitrogen to standing corn. COLUMBUS — Ohio farmers still have a little more than a year before they’ll be legally required to be certified in order to apply fertilizer to more than 50 acres. But nearly 12,000 have already taken the training, and more than 11,000 have been issued their certificates. 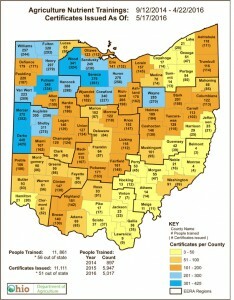 The progress is encouraging to Matt Beal, chief of the Ohio Department of Agriculture’s Division of Plant Health. He said it’s hard to say how many people need to be certified, because farm operations are constantly changing and not all farmers apply their own fertilizer. Farmers will legally need their certificate by Sept. 30, 2017, but should plan ahead so they can make it to one of the trainings, and receive their certificate in time. 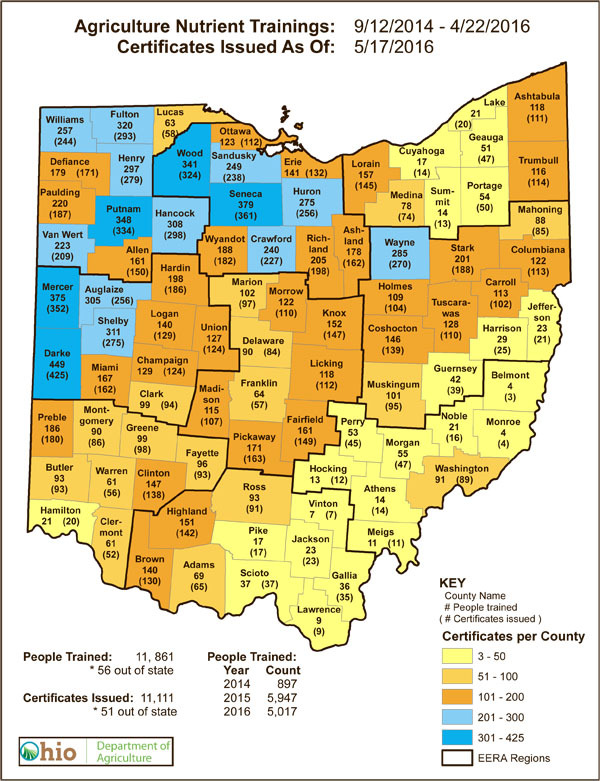 County map of the number of farmers and applicators trained and certified. The requirement is part of legislation approved in June 2014, that was part of the state’s efforts to reduce nutrient runoff. Training has been offered across the state, through a partnership between ODA and Ohio State University. Beal said farmers can attend a session in their own county, or in another county, depending on which one fits their schedule. Certifications are good for three years, and must be renewed. Beal expects there will be new information when they get recertified, because of all the ongoing research on nutrients, and how they move. “We’re going to have a lot of new research and data,” he said. The training takes three hours, unless the applicator already holds a pesticide license, in which case the training takes two hours. Certified fertilizer applicators will be required to keep records of things like the date, place and rate of application, the type of fertilizer and the name of the person applying it. Applying start-up fertilizer through the planter is exempt, and so is applying lime and limestone. 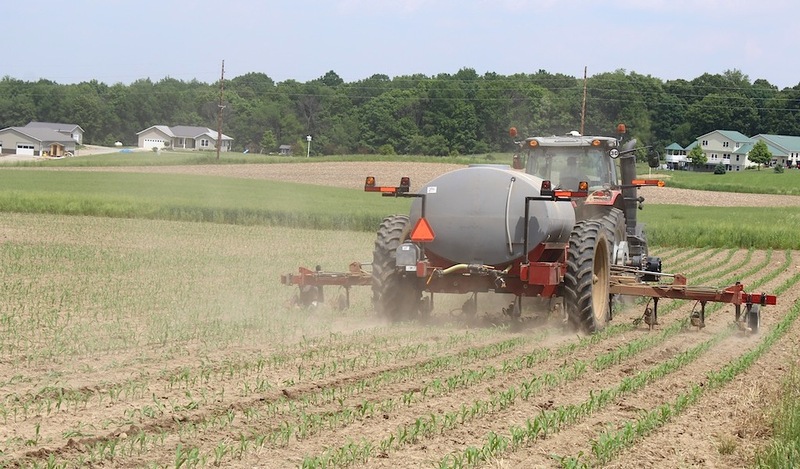 Farmers have been asked to fill out an evaluation of the certification process, and the results show that 76 percent agree or strongly agree that farm phosphorus is a significant problem to water quality. 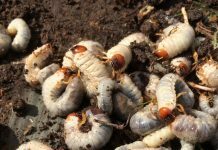 Some 77 percent said they had improved their knowledge after the training, 56 percent said they plan to change their nutrient management practices, and 84 percent said they plan to review their soil test and recommendations. Another group is working on a voluntary certification that certifies fertilizer retailers and crop consultants. The 4R Nutrient Stewardship Certification Program has certified about 30 retail fertilizer facilities that apply or advise farmers on nutrients. The 4R certification requires companies to apply or recommend fertilizer at the right source, rate, time and place. So far the program has covered about 2.3 million acres, and 1.8 million that are in the Western Lake Erie Basin, said Andrew Allman, executive director of the Nutrient Stewardship Council. Allman said the 4R program launched in March of 2014, and is audited by third-party auditors. It has a similar goal as the state program, but is voluntary and applies to nutrient providers, instead of individual farmers. Ohio governor includes water quality goals in budget. Senate moving ahead with water quality regulation. House Ag Committee holds hearings on water quality bill.